While rules to determine the gender of a noun exist, almost no German native speaker can name them. We can now solve this problem (determine the gender without memorizing the rules) using some simple machine learning with the Accord framework. After quite a while of searching, I found this machine readable and CC-BY-SA 4.0 licensed XML file from Daniel Naber. The next step is to split the dataset into training, test and validation sets. For this purpose I wrote a SplitRandom method that randomly selects elements from an IEnumerable and returns a List<T> with a specified size. You can look up the definitions of SplitRandom<T>() and LadeSubstantive() in the source code of the sample application at the bottom of this post. When you run this, it generates a model with 70-75 % success rate. 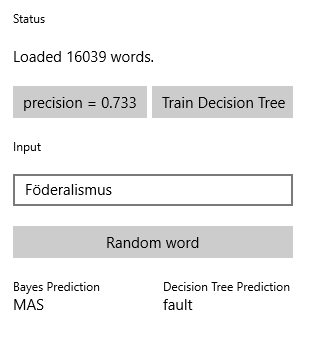 In the sample application you can see how a Decision Tree performs compared to the Naive Bayes (hint: better).